In some ways, tending a garden is like raising kids. You simply can't toss a few seeds out into the garden and then expect some results with out preparing the soil (teaching good principles), watering it as needed (giving constant love and attention), pulling out weeds (correcting our children and protecting them from negative and unhealthy influences, when and where possible), and channeling their energy to grow tall. 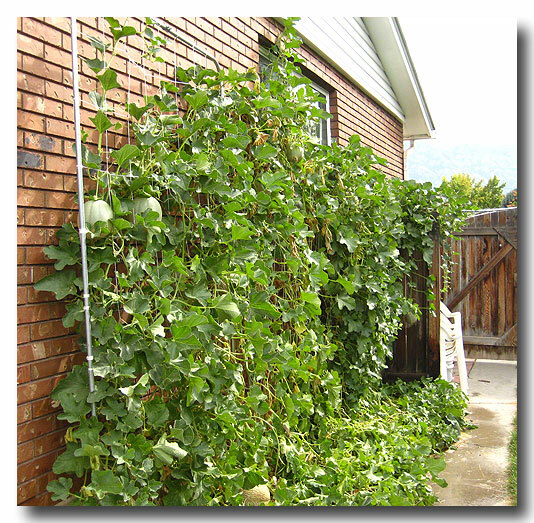 In our garden as you see here, we grow our melons vertically using different supports. Melons have the energy to grow just about anywhere, but you have to direct their energy and give them the right support to reach their potential. Over the years, we have had a good harvest by using this method, but we have to give it proper attention. Kids, in like manner, will flourish with the right amount of teaching, correction, support, and love. In my opinion, raising kids is the most difficult issue in our lives. Hence, not only we had to feed them and entertain them properly; but also, must pay full attention to their day to day personality changes, and without limiting their thoughts flow. For example, when your son is angry about his peers, don't hustle and judge him arbitrarily that he was in the wrong standpoint; however, give his a chance to reveal his intentions behind his action, and latter, you evaluate him. Keep in mind that he must one day emerge from the shadow and face the world individually.